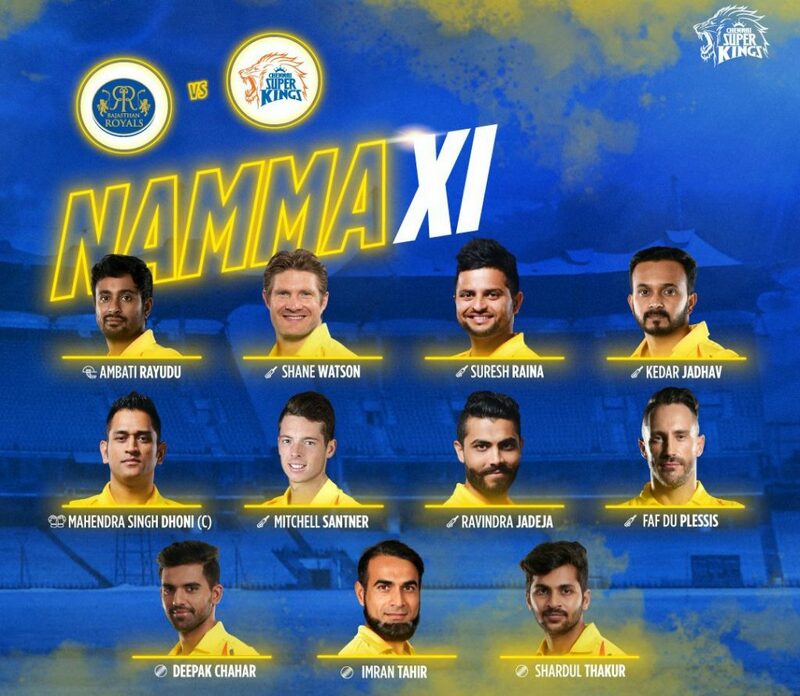 Chennai brought in Mitchell Santner and Shardul Thakur in place of Harbhajan Singh and Scott Kuggeleijn, while Rajasthan included debutant Riyan Parag, Jaydev Unadkat and Sanju Samson. After being sent into bat by Chennai, Royals opening pair off Ajinkya Rahane and Jos Buttler made a fantastic beginning, as the duo added 31 runs in 2.5 overs, before Deepak Chahar dismissed Rahane leg before wicket for 14. Buttler took on Thakur by smashing him for three consecutive fours, before the former was caught at extra cover for a quickfire 23. The home side suffered a major blow as they lost the in form Sanju Samson who caught at deep midwicket by substitute fielder Dhruv Shorey off Santner. Rahul Tripathi who was dropped by Dhoni early on in his innings, failed to cash in on the opportunity, as he was caught at backward point by Kedar Jadhav. Steve Smith struggled to get going in his innings as he was dismissed by Ravindra Jadeja. Ben Stokes and Parag added 25 valuable runs for the the sixth wicket, before the latter was dismissed for 16. Jofra Archer and Shreyas Gopal scored some handy runs down the order, as Rajasthan Royals posted 151/7 in their allotted 20 overs. For Super Kings Deepak Chahar, 27 year old Shardul Thakur and left arm spinner Jadeja bagged 2 wickets each. Chasing a target of 152, Chennai Super Kings got off to a horrendous start by losing Shane Watson in the very first over to Dhawal Kulkarni. Suresh Raina was run out by a brilliant throw from Archer. Faf Du Plessis soon fell as Tripathi took a well judged catch at the deep mid wicket boundary off Unadkat. In the 6th over, Kedar Jadhav was caught magnificently by Ben Stokes, as the home side were struggling at 24/4. Ambati Rayudu along with skipper Dhoni steadied the innings by adding 95 runs for the fifth wicket, before Stokes dismissed the former for a well made 57 runs in the 18th over. With 18 requiring off the last over, the 30 year old Jadeja smashed the first ball for six, but the England all rounder came up with a bang by dismissing the former Indian skipper. With 3 requiring off the final ball, Santner smashed a six to seal a dramatic win for CSK. 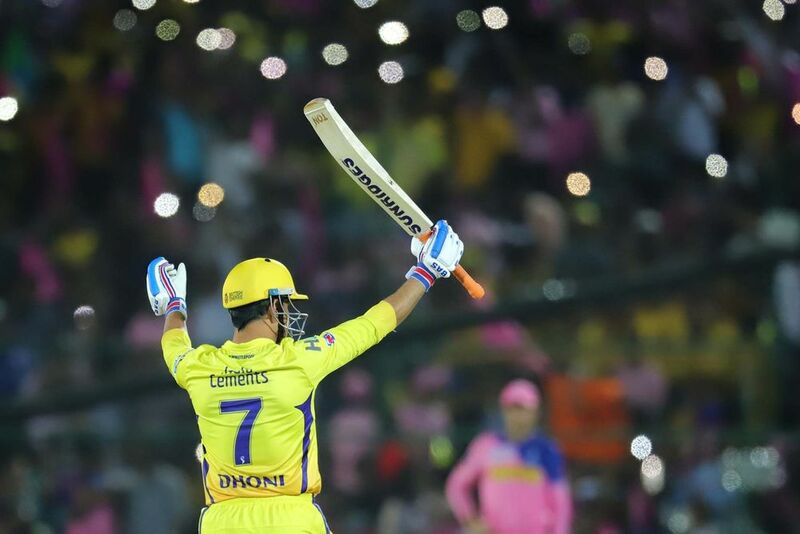 With this win MS Dhoni became the first skipper in the history of IPL to win 100 matches. The 26th Match of the Indian Premier League will be played between Kolkata Knight Riders and Delhi Capitals at Kolkata on 12 April, Friday.